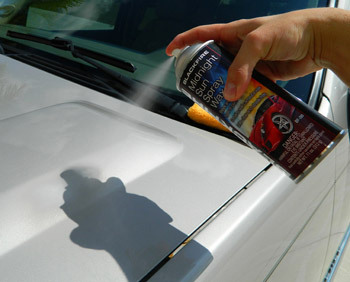 Quickly and easy remove bugs and tar with BLACKFIRE car care products!� We carry the highest quality bug and tar removers, the best bug sponge and a selection of premium auto detailing clay bars.� Put away the high-octane cleaners and rocks-in-a-bottle compound and learn how to remove bugs and tar without scratching your vehicle�s delicate clear coat finish. Surely your best friend�s college roommate, girlfriend�s uncle or co-worker�s wife has shared a remedy for removing bugs that involves some type of engine lubricant or driveway cleaner. Say no! Harsh solvents are best left in the garage for things like removing oil from engine blocks or lubricating squeaky door hinges. These high-octane cleaners cause more damage to your vehicle�s delicate clear coat finish than the bug guts do! BLACKFIRE Bug Remover is the solution! Blackfire Bug Remover is an incredibly effective product that will allow you to eliminate the caustic and acidic insect remains from your car�s paint. Blackfire Bug Remover was made using natural cleaners and solvents that will gently remove the corrosive bug remains from your paint without inflicting any marring itself. Use this incredibly effective cleaner in conjunction with the BLACKFIRE Bug & Tar Eliminator Sponge and you�ll be able to remove bug guts in seconds! After a couple minutes have passed, wash the affected area with the bug sponge, being sure to soak it in your soap solution often.� Once the area is clean, rinse it thoroughly and towel dry.� To restore any lost protection, apply a quick coat of BLACKFIRE Midnight Sun Spray Wax. To remove tar, spray a liberal amount of BLACKFIRE All-In-One All Purpose Cleaner directly onto the surface and allow 5-10 minutes time for the cleaner to penetrate.� Wipe clean with a microfiber towel, and apply a coat of BLACKFIRE Midnight Sun Spray Wax to replenish any protection that may have been lost. 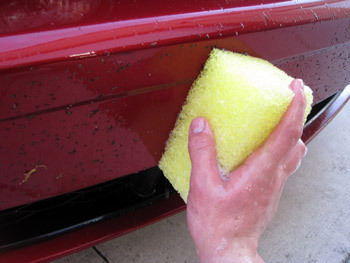 Another effective way to remove bug and tar residue is with a clay bar.� A clay bar contains an abrasive that shaves off contaminants.� Using a clay bar is simple: spray the area and rub the bar across the surface.� Re-knead the bar to trap the contaminants and proceed to the next section.� BLACKFIRE offers two clay bars � medium and fine grade.� Use the fine grade for black or other dark colors, and the medium for light colored cars or for stubborn contaminants and residue. Regardless of which method you choose, it's always important to remove bug and tar residue as quickly as possible. Bug guts are acidic, and they will cause permanent damage if they're left on the surface too long. Tar residue will slowly eat away at your clear coat, diminishing the appearance of your vehicle by causing damage that cannot be reversed. Frequent car care is easy to car care!